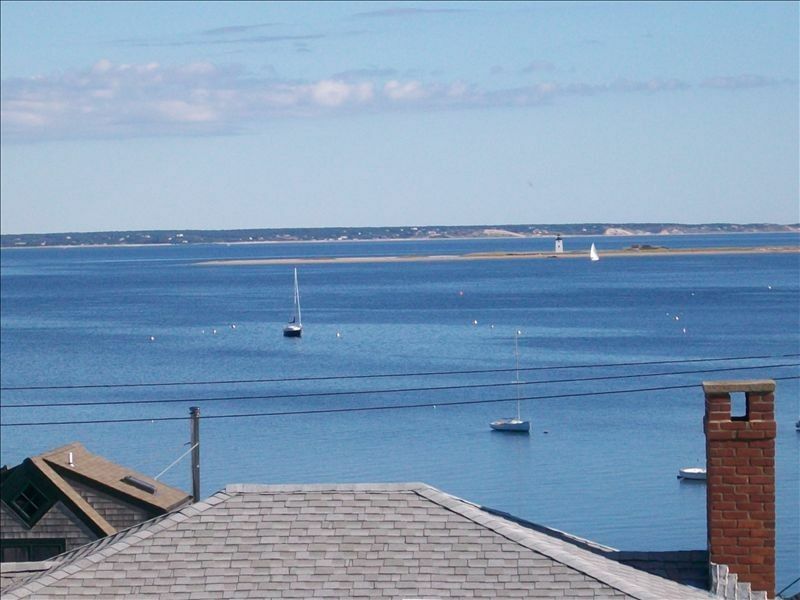 Enjoy spectacular waterviews from this recently renovated two level, two bedroom, 1.5 bath penthouse. Enter to second level foyer. Full bath and two bedrooms on second level. Ascend winding staircase to third floor living area with a wall of glass and 40' private deck offering stunning town and harbor views. Living Area, fully equipped kitchen, dining, and half bath located on upper level. Tastefully decorated. Air condition units in both bedrooms and the living area. Quiet environment. Bed linens and bath towels provided. Convenient West End location just two blocks from the Boatslip Resort and one block from Mussel Beach Gym. Located at 5 Conant Street, a quiet residential street , in the West End. It's an easy stroll to shopping, restaurants and nightlife. Automobile not necessary however, on site parking is provided. Friendly and conscientious owner maintains the property. The interior is neat and clean. Owner is available, via cellphone, for any questions or requests. Property is in a very desireable location, the near West End, on a quiet street but close to beaches, shopping, nightlife and restaurants. Gym facility is 1 block away. Awesome 180 degree waterviews, desireable location, quiet yet convenient. Clean, comfortable, friendly. On site parking . Bathroom has a large 4' wide shower .toilet , and vanity with large mirror. The half bath on the upper level has a toilet and sink with large mirror . Both baths have exhaust fans. Units in each bedroom and also in the main living area. Smooth top stove and oven. The kitchen has all cooking utensils, dinnerware and silverware. Stove, Toaster, microwave, coffee pot. There is no dishwasher. 40" flatscreen tv in living area , small flatscreen with CD player in one bedroom . duncan s.Where do you live? We enjoyed our getaway to Provincetown at this property. The deck has a phenomenal view and watching the sun go down on Cape Cod Bay with a glass of wine in my hand each evening was the highlight of the trip. The property is centrally located to everything and Jack is available if you have any questions. My partner and I loved staying at this condo. The unit is well kept inside and out. The bedrooms, living room, kitchen are good sized and nicely decorated (with great closet space). Jack was friendly and responsive. The location is perfect and the view is spectacular. The pictures don't the the condo or the view justice. We will definitely be back soon! Lovely condo with great views of the harbor. Would highly recommend this terrific condo, located near the heart of town! Lovely harbor views from the large deck really enhanced our stay. Easy day trip to Boston on the nearby ferry. Wonderful selection of eateries, shopping and bars ( not to mention the beautiful beaches) to enjoy. Jack, the owner, could not have been more pleasant, helpful or more accomodating. Thoroughly enjoyed our stay in P-Town!! We have stayed here twice. Both times the property was spotless, well maintained, quiet and comfortable. 2 bedrooms downstairs share a bath and there is a half bath upstairs on the main level along with full kitchen and living that opens to large deck with chairs and a view over the harbor. There is lots of natural light and the location is great in the near West End, half block off Commercial, so you can walk to everything easily. Grocery, restaurants, liquor, bars, galleries, gym, shops are all within walking distance. 5 minute walk to the very center of town. You don't need a car. Jack is a great host and was available next door to answer questions or assist, but everything went smoothly and we wouldn't hesitate to stay again. The place is perfectly situated in the center of town but away from the crowds and noise. Stunning views. Kitchen has everything you need and top floor is full of sun. Parking space is a real plus. A great home base for anyone who wants to explore the area. Jack was very helpful and attentive. Our experience with this property was positive. Jack greeted us when we arrived, showed us around, asked about changing towels, made us feel at home for the week. He was always very cheerful and upfront about some of the other reviews on the site. After talking to him about them on the phone before we committed to the rental and again once we got there I was satisfied and would return if all the variables line up again.